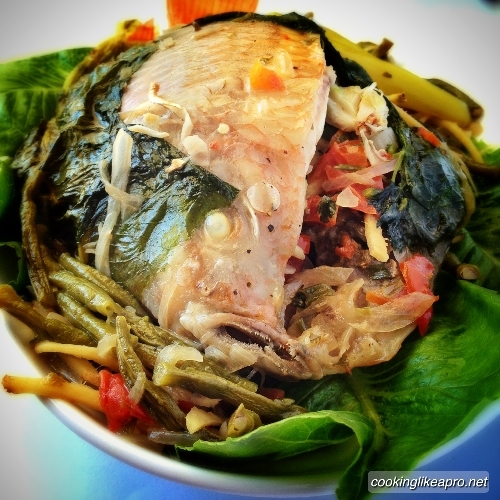 Sinanglay is a tilapia recipe that hails from the Bicol Region of my beloved Philippines. It's a dish where the fish is wrapped in vegetable leaves while it bathes in creamy coconut milk, under a bed of long green beans (sitaw). Being a native to Bicol, expect spice and heat in this dish's rich sauce. Honestly, I didn't know how sinanglay is cooked or what sinanglay is. It was my cousin-in-law Ron, who introduced me to the dish. In fact, he was the one who cooked it when he visited us in Bangkok. Small, palm-sized tilapia fish are usually used in cooking sinanglay. They are stuffed with spices in their belly, wrapped in pechay (or bok choi) and are cooked in coconut milk. 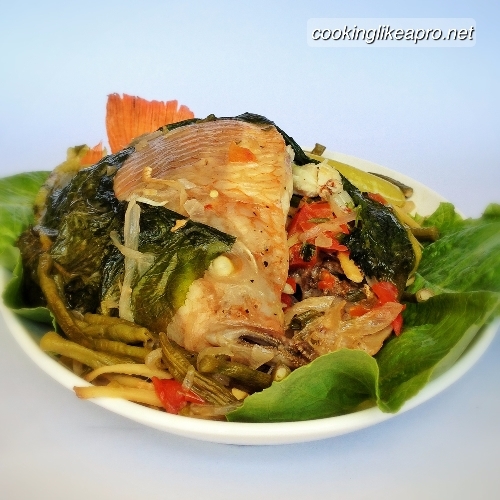 In this recipe however, we used one whole tilapia since there were no small ones that day in the market. Also, we used cos lettuce to wrap the fish, instead of pechay. It turned out so well, I just had to share it with you guys! Mix the onions, tomatoes, ginger, parsley in a deep bowl. 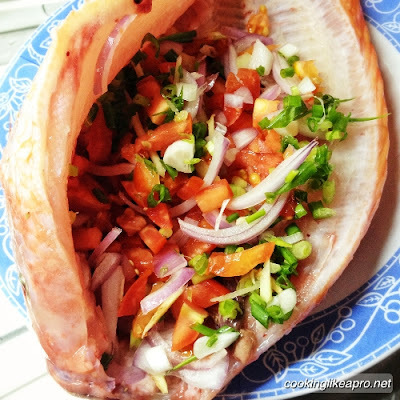 Insert the spices or fillers inside the tilapia fish. Place the long green beans and green chili and remaining spices and herbs in a pan. 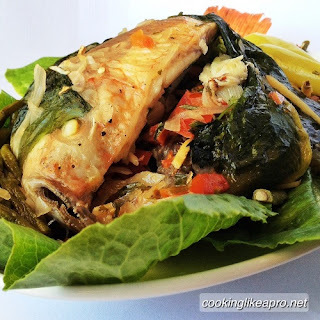 Wrap the tilapia with cos lettuce and place them one by one on top of the beans. Season with fish sauce and ground peppers. Place the pan on stove. Cover under medium to high heat. Check the dish after 20 minutes. When the fish cooks, open the lid to allow the dish to dry a bit. Lower the heat to medium. Taste the sauce. Add fish sauce or salt, according to your preference. Add more green chili for a more spicy dish. If you want the fish to be a bit dry where the skin sticks to the fish meat, allow the dish to simmer without cover. It's seriously, one nyomy fish dish! About the Author: Beingwell loves simple home cooking recipes. 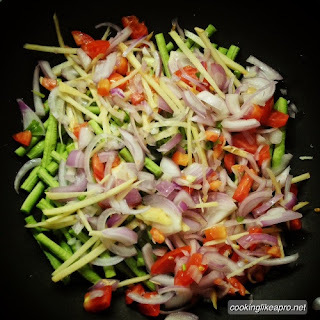 She enjoys sharing her quick easy meals, including Filipino cooking recipes in this blog. Enjoy cooking like a pro! I'm really digging this technique you used by stuffing those ingredients right into the fish. Definitely something I look forward to trying :) Thanks for sharing this!